The first road-legal autonomous truck made a splashy debut earlier this month. The Freightliner Inspiration Truck is shiny and new, but it will not be good for everyone. Autonomous trucks will destroy jobs, Scott Santens points out at Medium, killing the truck stop as we know it. Those 3.5 million truck drivers driving all over the country stop regularly to eat, drink, rest, and sleep. Entire businesses have been built around serving their wants and needs. Think restaurants and motels as just two examples. So now we’re talking about millions more whose employment depends on the employment of truck drivers. But we still can’t even stop there. Those working in these restaurants and motels along truck-driving routes are also consumers within their own local economies. Think about what a server spends her paycheck and tips on in her own community, and what a motel maid spends from her earnings into the same community. That spending creates other paychecks in turn. So now we’re not only talking about millions more who depend on those who depend on truck drivers, but we’re also talking about entire small town communities full of people who depend on all of the above in more rural areas. With any amount of reduced consumer spending, these local economies will shrink. 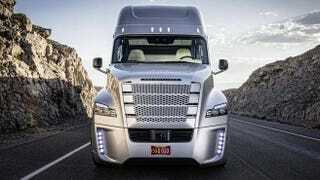 But autonomous trucks have obvious benefits, too. Trucking is a decently paid job but also a dangerous one. It takes truckers far from their families for long stretches of time. It encourages poor lifestyle habits. There are over 300,000 crashes involving heavy trucks every year. Autonomous trucks will almost inevitably start taking over our roads, but it is worth pausing to consider their unintended effects. A few weeks ago, Martin Ford, author of Rise of Robots, pointed out the ripple effects of autonomous cars in Gizmodo. Not everyone will be a winner in the self-driving future.